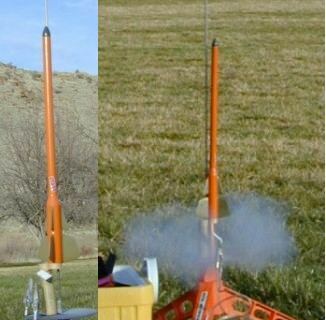 Essence's Model Rocketry Reviews (EMRR) is pleased to share their very own contest idea with you. We have partnered with Apogee Components (the awesome prize supplier) to create this never-before-done "Virtual" Rocket Contest. 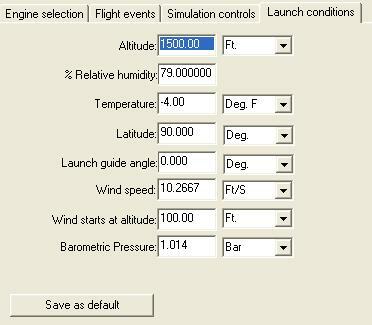 Yes, grab your copy of RockSim (or the Demo version) and build a rocket that meets the requirements below and we will have a virtual "flying" contest on March 14, 2003. Entries must be received by 3/9/2003. Contest will take place from 3/10 - 3/14. NO Mass Objects for adjusting weight and CP other than normal required items like shock cord, eye-screws, etc. * NOTE: All "contest" settings and entries will not be disclosed until all entries are in! AeroCFD- A program that turns your computer into a sophisticated wind tunnel. Use to find an accurate measurement of Cd on subsonic rockets. FinSim - A structural analysis program to determine if your fins are strong enough for wild flights. Aspire - The rocket that made the commotion just kept going, and going, and going. It just didn't seem to want to quit. They gasped. "That thing must be more than a mile high," they tell the guy next to them. Saturn 1B Wall Poster - Highly detailed rendering of NASA's historic Saturn 1B rocket. A registered version of RockSim 6 for the top two Demo User Submissions! NAME OF CONTESTANT NAME OF ROCKET FILE FINAL STANDING! Comments: This contest was interesting because the highest actual flier did not become the leader. Once the weight is multiplied to the altitude, super high fliers were reduced because they were so heavy. The "versatility" part is also interesting, since the rocket designs performed differently with the different motor thrust curves, the leader performed about the same across all three motor types. This, in combination with the other contests, might make a good NAR RD project. CONTEST #2 -Max Altitude: your rocket will fly with a "contest mass override", "contest conditions", and a "contest" motor. The placement score will be the Altitude (ft) . Comments: We believe this contest really shows off "good design" once the weight is normalized for all entries. CONTEST #3 -Slow and Low: your rocket will fly in "contest" conditions with (1) "contest" motor. The placement score will be based on highest Time to Apogee (sec)) and lowest Altitude (ft). Comments: This contest was tough to score, so we decided to create the following point system. We still don't really like it, but all rockets were measured under the same conditions. Winner's Bracket: Your rocket will accumulate the score, from 2-3 points (based on above) for each win in the winner's bracket. Loser's Bracket: Your rocket will score zero (0) points for each loss. Your rocket will score 1 point for each win in the loser's bracket. No Opponent: If there are not enough entries to fill the brackets (once sized to the smallest increment of 8) then a "no opponent" advance will gain 1 point. Do I interpret "There must be at least 2 sets of 3 or 4 fins, different shapes and the bottom of the root edge at a different place" to mean the the two fin sets cannot be placed to make a 6-8 fin rocket? In other words, the trailing edges cannot be at the same location? Not exactly, you could have a 6 or 8 finned rocket just as long as the bottom (rear) of the root edge is not in the same spot. For example, 1 fin set even with the bottom and the second fin set (splitting the first set and a different shape) at 0.5" from the bottom. Or 1 set of fins even with the bottom and another set up by the nose cone. Or... oh, you got it I'm sure. How does this Bonus thing work? The 1% bonus improves your virtual flights by 1%. For example if you fly to 1540 feet, you will be recorded at 1555 feet. Yes, not much, but we suspect some very close competition and it is geared toward a "virtual" rocket contest, but we wanted to award some that actually built the rocket. What is the measure for the one caliber rocket stability requirement Barrowman or Rocsim? Each of the first 3 events have a "placement score" described. That placement score will then be reversed ranked by the total number of entries. This will give the maximum number of points to the winner in the event. For example, if there are (4) entries and in contest #3 (minimum altitude) and entry #1 gets 800 feet, #2 810 feet, #3 750 feet and #4 950 feet. Then the scores will be 4 points for #3, 3 points for #1, 2 points for #2 and 1 point for #4. You say materials must be those listed in RockSim ... can I build/design any part using those materials? Yes, you may. This does not imply that you have to take the part from the database. In the events that are described, is the Maximum Altitude the maximum possible (excluding the delay of the motor(s) chosen) or actual predicted (including the delay of the motor(s))? I.e., a design could go 1500 feet on a C6-7 but less on a C6-5 because of early ejection. There are set motors for Events 1, 2, and 3 with set delays. Thus far with 9 entries the delays have not impacted the events. For event 4, there is a set motor, then I will choose the delay closest to the predicted delay. How does this Drag Race, Double-Elimination thingy work?